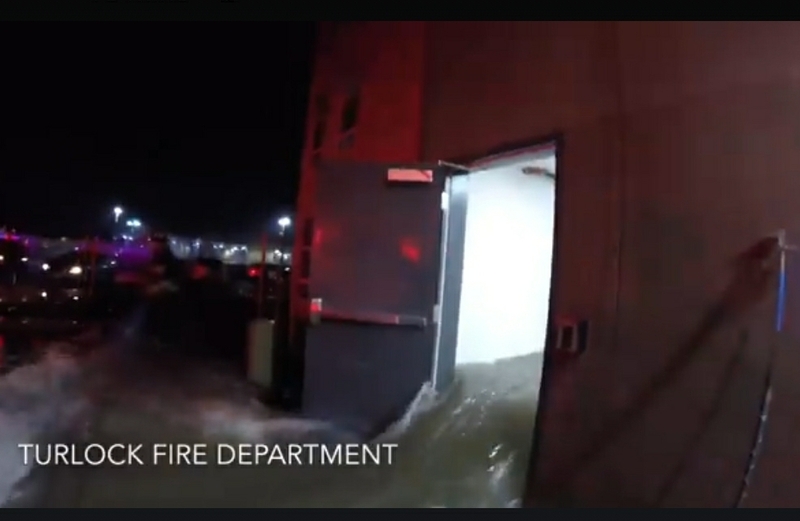 Turlock City Fire was dispatched to reports of major flooding at an apartment complex on the 900 block of West Monte Vista Avenue at 12:55 a.m., January 14, 2018. Fire crews arrived to find a major water leak in the interior stairwell of the apartment building. Crews assessed the leak and turned off several water mains to stop the flowing water. Electricity to the west wing of the building was also shut-off due to the extent of the flooding. Turlock City Fire crews assisted officers from Turlock Police Department with the evacuation of multiple residents and were able to rescue a non- ambulatory victim from a first-floor apartment as the flood water was rising. An AMR ambulance stood by until it was determined there were no related injuries. The apartment manager was also on-scene and made all necessary arrangements for placement of the displaced residents into nearby hotels and vacant apartments and dorms. Turlock City Fire responded with Engines 31, 33, and 34 and a battalion chief, totaling ten personnel. The cause of the flooding remains under investigation. Any inquires or information regarding this incident can be addressed by contacting the Fire Marshal at 209 669-2119. Video by Turlock fire department.